What is the Supreme Court? Where is it? What does it do? I have to confess that, until last Thursday, I had only the haziest idea. I knew it was the highest court in the land and I assumed it was somewhere near the Royal Courts of Justice. I felt I ought to know; after all, what the Supreme Court decides affects us all. So I booked in for a tour…. I need to start with a bit of background. Please bear with me. Before the Constitutional Reform Act of 2005, the twelve lords of appeal in ordinary, known as the ‘Law Lords’ represented the authority of the House of Lords as the UK’s ultimate court of appeal. They were appointed by the Queen. They could, in theory, vote on something in the House of Lords – fox-hunting say – which later, they might have to make a judicial judgement about as Law Lords. They had no special room within the House of Lords, they used in any committee room which happened to be available. Even though, by custom, they refrained from voting in the House of Lords, their judicial impartiality was hardly transparent. The Constitutional Reform Act recognized that law and politics must be seen to be separate, and so the Supreme Court was set up in 2009. 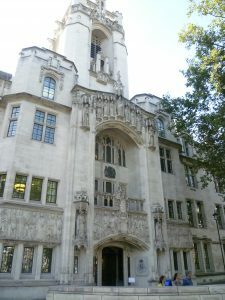 It took on the judicial functions which had previously been assumed by the Law Lords, now called Justices, who were appointed by an independent select commission who aimed for a balance of Justices with varied experiences of the law from across the U.K.
At the moment, the twelve Justices are all white and only one is female. All the men were privately educated so, plainly, there’s still a long way to go. To be fair, this is partly because of their age. When Lady Hale, the Deputy President, went to Cambridge to read law (from her State school), there were only three colleges for women to twenty-one for men. At least educational opportunities are now more equal for future Justices. 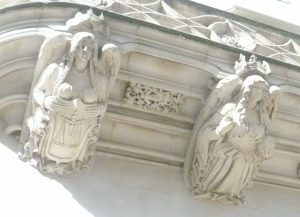 The new Supreme Court couldn’t remain in the House of Lords (who were pushed for space, anyway) so it moved to the Middlesex Guildhall in Parliament Square, opposite Westminster Abbey. 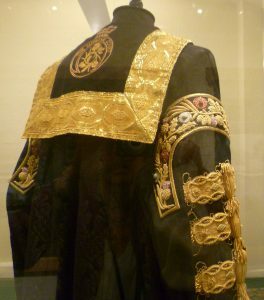 The Middlesex Guildhall has always been associated with the law. First built in 1805, it was completely rebuilt as a court house by James Gibson in a Neo-Gothic style (1912-1913). It had eight courtrooms, together with cells and jury rooms. A massive restoration was needed to make it fit for purpose as the Supreme Court. 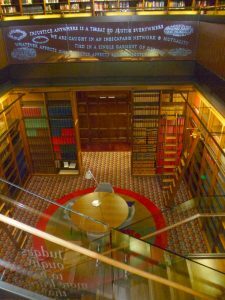 It now has three courts and an important three-tier library, as well as offices, a public café and an exhibition centre. 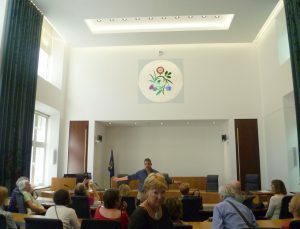 The lay out of Court Room 1 reflects its function. 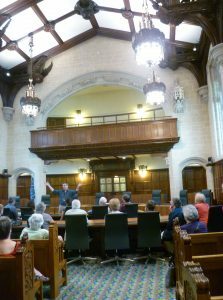 This is no traditional court room with a dock, witness stand, seats for the jury, or presiding judge. The Supreme Court’s role doesn’t need any of these things. Its function is to interpret the law where it isn’t clear; or to set aside obsolete precedents. For example, a recent judgement looked at whether Parliamentary privilege covered MPs not having to explain their expenses. It had to examine what ‘Parliamentary privilege’ originally covered and decide whether 21st century expense claims came within that definition. Fortunately for democracy, they decided that they didn’t. At the back of the room there are eight seats for Judicial Assistants. An extra seat on the left is for the Usher who prepares the room and makes sure that everyone arrives on time. The Registrar has a chair on the right. In front of them are nine Justices’ seats is a semi-circle. Most cases have five Justices and take two days, but there can be seven or nine Justices, depending on the case’s complexity. Odd numbers ensures a majority vote. Facing them are six advocates’ seats. There is no prosecution and defendant. Instead the appellant sets out a legal argument; the respondent offers a counter argument, to which the appellant can then reply. The Justices listen, consider and discuss. 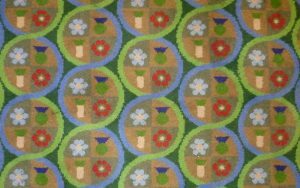 This is not about guilt or innocence; it is about interpretation, and the room is arranged, not for confrontation, but to support discussion and learned debate. Behind the advocates’ seats are eleven seats for their clients and assistants. And, lastly, there is seating (on uncomfortable benches) for about twenty-four members of the public. All cases are routinely filmed and available to watch online. Transparency is crucial. Court Room 2 is modern and smaller. 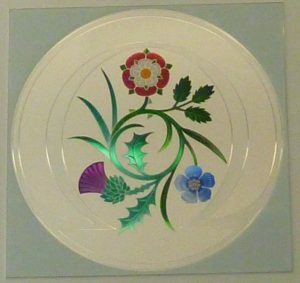 The roundel on the wall shows the Tudor rose of England, the thistle of Scotland, the blue flax flower, representing Northern Ireland, and the fan of leek leaves represents Wales. The whole is surrounded by an omega – Ω – the last letter in the Greek alphabet, symbolizing that the Supreme Court is the final court. 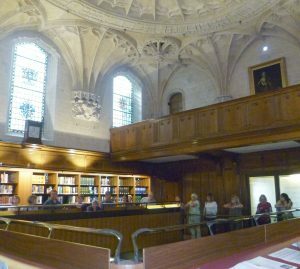 The last room on show to visitors is the Library for legal research. In many respects, this is the star of the show. It is on three levels. The engraved characters in blue read: Injustice anywhere is a threat to justice everywhere. There are other quotations, including ones from the Roman lawyer and statesman, Cicero, and the Bible. I liked the impressively carved ceiling and the stained glass coats of arms in the windows. 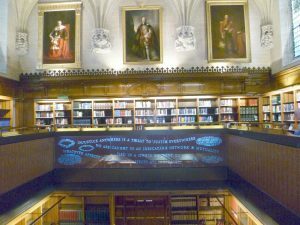 This is a room which is eager to display its historic credentials and emphasize its learning. There are further bookshelves below. Note the sliding step ladders to reach books on the high shelves. 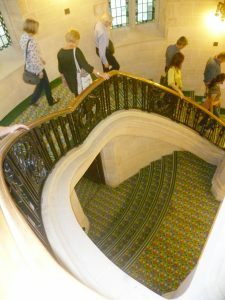 The tour took us upstairs and downstairs and, going down, I paused to admire the staircase and the shape it made, though I have to say I don’t care much for the carpet (see photo higher up). It seems more suitable for a children’s book illustration than for the highest court in the land. The café is situated in the basement in a light well which gives it a feeling of light and openness. 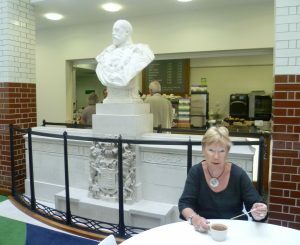 I was rather amused by the large bust of King Edward VII with King and Emperor engraved on the stone plinth standing right in front of where you queue up for coffee. 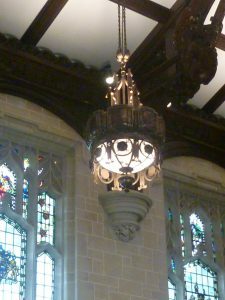 It had the faint look of an altar with the railing in front. A rather incongruous place to put it, I thought. However, the coffee was very welcome. That’s fascinating. I didn’t know you could do tours of such a place. Link with the Beatles cover made me smile. Perhaps not the aura of solemnity they might have been seeking. I was surprised, too. But it’s an interesting tour – only an hour. And I now understand how important their work is. Apparently, there are dozens of laws passed in the House of Commons and a large number of them seem to be badly worded and unclear. The Supreme Court is kept busy, quite apart from the big cases about things like Parliamentary privilege. Amazed that the Supreme Court only came into being in 2009. I could have sworn I’d heard it spoken of for years and years! Was it perhaps called that informally when it was still the Law Lords? I’m glad they chose that wonderful old building. Sounds a fascinating tour. Thanks for your interesting comment, Elizabeth. The Supreme Court was first mooted in 2005, so you have heard of it for eleven years at least! No, it was not called that informally prior to 2005. I, too, was confused about what it was called before, but it was just the House of Lords, part of whose job was to be the highest court in the land. Hence the twelve Law Lords, who were Life Peers (unless they happened to have inherited titles). I did this tour a few years ago and I was surprised and fascinated. A lifetime will never be enough to visit all the places to which we are lucky to have access. Sometimes though it isn’t just the time, it’s knowing even that they are there. So many gems! I agree, Natalie – especially about the importance of knowing that the place is a) there, and b) accessible. Beautifully explained – far better than the rather woolly exposition in year one of my law degree. 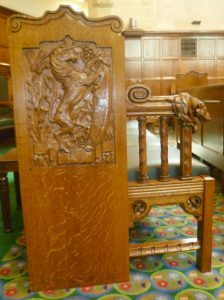 I’m intrigued as to why they chose to carve King Stephen’s image onto the end of the bench? It’s so odd – isn’t he mainly known for being rather hopeless and for tussling over the crown with his cousin Matilda? Henry I would have been a better bet. I agree about King Stephen. Thanks to him denying Matilda’s right to the throne (she was the daughter of Henry I, and a very capable woman) on the grounds that she was female, the entire country was plunged into civil war. 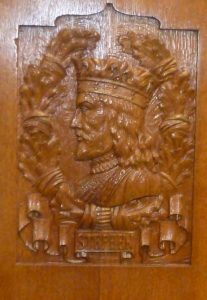 He was a rotten king, so why he’s commemorated on the pew end, I don’t know – except, perhaps as an Awful Warning of what not to do!